Electric bus manufacturer Build Your Dreams (BYD) has kindly offered Southern California Transit Advocates an opportunity to tour their electric bus manufacturing plant in Lancaster this Friday, July 11th. The tour group can include up to 20 people and at this time we have about 10 members who have made a reservation. Since open slots are available if any Streetsblog readers would like to join us you can contact me by Wednesday (tomorrow) afternoon at dgabbard@hotmail.com to join this rare opportunity to see how buses are built. Only cost is for transport and any incidentals. The address of the plant is 46147 BYD Boulevard, near the intersection of 7th St. W and W Avenue G.
It is slightly over two miles on Sierra Highway, or 40 minutes. There is a gas station and sub shop at Avenue H and 10th Street West, for those who need to grab a quick bite. The distance from the bus stop to the plant is just over 1/2 mile. Tour begins at 12:30 pm. They did not give us a duration but we expect it to last no more than 2 hours. Otherwise, participants can explore Downtown Lancaster and board Metrolink at 6:05 pm, arriving LAUS at 8:25 pm. The Lancaster library is open until 6 pm and has air conditioning, in addition to the coffee shops and bars in the area. 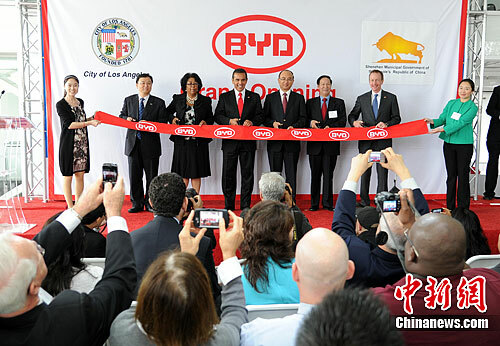 We wish to thank Micheal Austin and Joanne Wang of BYD for arranging the tour, and SO.CA.TA member Hank Fung for his assistance in arranging the tour and coordinating with BYD staff. LOL – Forget the Library. Stick to the Retailers, Restaurants (Craft Brewery), Theater, Bowling Alley and Museum.